Way back in 2015 I purchased and reviewed the DG revised version. As part of the review I played a few games, but did not write them up. And, having spent longer than I planned dealing with errata and the like, and then having had to work through Kevin Zucker’s Library of Napoleonic Battles I had not had the opportunity to have another go at WWI. So, as the centenary of the armistice rolls closer time to get a game in ‘during the war’. By now I have the Deluxe edition rules from the internet, so errata are not (much) of a problem, although still played with the original magazine map and counters. I went for the historical setup and as usual played solo. The initial German assault in the west took Liege and eliminated the French 4th Army. The French switched the 5th Army from Epinal to Reims (the rules DON’T list this as an army that cannot move on Impulse 1), the BEF occupied the northern coalfields and the Belgian Army hung on in Brussels. The Germans took Epinal, but in the north Antwerp held out, although Brussels eventually fell. The Germans never entered northern France (and the buzzing noise they could hear was Schlieffen revolving in his grave). In the east things did not go well either. 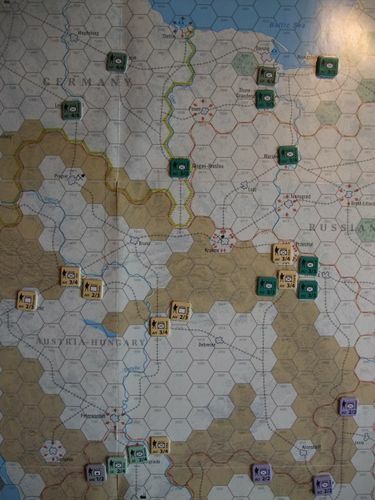 The Austrian attacks on Belgrade were held, although the Serbs were at their last gap as autumn arrived; in a counter-attack they eliminated an Austrian army, at the cost of one of their own. In Galicia a titanic struggle for Przesmly drew in four Russian and three Austrian armies. Both lost an army to overwhelming attacks; as the leaves fell the Austrians held the city. In East Prussia Koningsberg fell to two Russian armies; advancing west they forced the German 9th Army to retreat. Other armies took the fortress of Thorne and also Breslau, seizing the Silesian coalfields, as German and Austrian resources slumped to zero! Austrian just avoided collapse as did Belgium. Over winter the Allies moved into northern Belgium, the British shipping an army to the port of Antwerp. The Germans drove the French back at Charleroi, but then abandoned this, and also Epinal, as they were too exposed as salients. 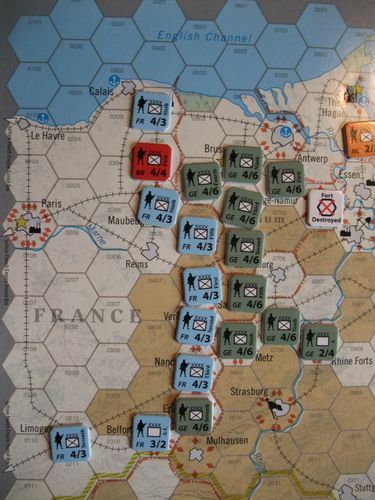 The withdrawal back to Belgium may have been a mistake as a concentric attack on Brussels eliminated the German 9th army (a lucky die roll at 10+ attack) and the Belgium capital was liberated. 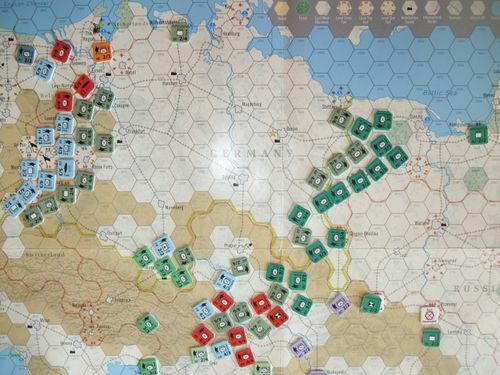 Eastwards the Russians took Posen and occupied all of East Prussia. Encircled by the Russians in Galicia the Austrians abandoned the coal mines, and after a heroic resistance against overwhelming odds Przesmly fell. German and Austria frantically built armies to cover their fronts; Austrian was now fully mobilised. The Allies built armies and expeditionary corps ready for intervention somewhere. Both were slightly surprised when that provide to the Balkans as Romania joined the Allies and Bulgaria the Central Powers. Bulgaria had made a very bad mistake [As the CP I really did not think this through!] as Allied forces poured into Greece and then into Bulgaria while the Romanians fell on them from the north. By autumn the last Bulgarian army had been trapped against the Turkish frontier and eliminated while French and British armies headed into Serbia. In the north German attacks on the Russians entrenched in East Prussia were embarrassing and costly failures; Allied attacks in the west drained their resources as well and in late summer an Allied offensive drove the Germans back from the south of Belgium. In winter 1915, seeing which way this was going (and aware of the French army poised in the Alps to take Milan if they made the wrong decision) Italy joined the Allies. The French joined the Italians for the next two years in unfruitful attacks on Trieste and the Austrian Alpine forts. But this did pin four Austrian armies down, which were desperately needed elsewhere. In the east Russian, Romanians and British forces poured into Ruthenia and Transylvania; the Germans had to send their own forces to bolster the line as the Serbs attacked into Austria, with British help, and eliminated an Austrian army. In the north the Russians had rebuilt the German forts and fell back to hold that line successfully against the German assaults. The Ottomans had decided to stay out of the war; the Allies had other ideas and in Summer 1916 swept across the Egyptian frontier to take Jerusalem, landed at Beirut and drove the Turks from Damascus, while in the Caucasus the Russians took Erzurum and advanced onto Mesopotamia. In Europe the Romanians and French overwhelmed the Turks and took Constantinople. That autumn Turkey collapsed, while Greece and Bulgaria surrendered. In central Europe the Austrians in Hungary were overrun, Budapest fell and German armies formed a line on the Austrian frontier – once again the Ostmark against the Slavic hoards. Winter 1916 saw the arrival of the USA on the Allied side; losses to unrestricted submarine warfare, which had badly damaged the British economy, proved too much. The Germans summonsed up a great effort of national will to bolster their economy for the difficult winter ahead. In the east Krakow, having endured a Russian siege all summer, finally fell and in East Prussia a Russian army was overrun – but there were plenty more to fill any holes in the line. At sea the U-Boats reduced Britain almost to starvation (0 MP), but an attempt to break the blockade saw the High Seas Fleet roundly defeated -Britannia certainly ruled the surface of the waves. The Ottoman Empire surrendered, Austria exerted its National Will to survive [a guaranteed collapse otherwise] and the French stiffened their sinews for La Patrie; calling for great effort for 1917. Despite this summer 1917 saw little movement, but much bloodshed and another Russian army overrun. Winter 1917 saw the beginning of the end. Attacked on all sides Germany ran out of reserves. In the west Metz, then Saarbrucken fell to the French, aided by their new Tank Armies and the Austrian Alpine fortresses finally fell. As Graz was taken Austria collapsed. 1918 saw a German Army surrounded and eliminated at Tannenberg; the loss of East Prussia, Czechoslovakia, Vienna, Luxembourg and Belgium and the Italians taking Munich. As Austria surrendered in autumn the Allies flooded into Germany [The Germans had 25 MP from their Mobilization Centres, less 25 MP due to the stage of the war – so nothing!] – Russians marching down Unter der Linden, the British taking Hannover and the Kaiser fleeing to Flensberg and abdicating. The war was over; Germany had very defiantly been defeated in the field. An Imperial Victory for the Allies – no point in counting the VP at this stage. 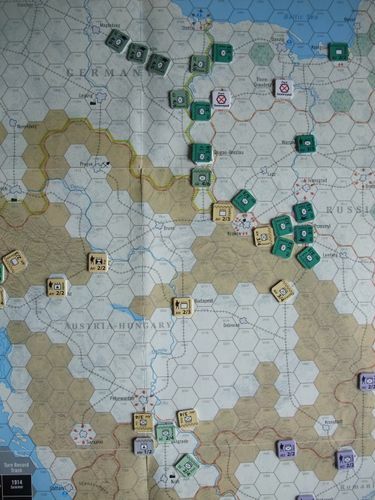 Mine was a very different result from Steven Dolges’ game as described in his excellent and detailed AAR Some of this is down to the diplomacy – in my game Romania joined the Allies early which had a big effect - some down to our different approaches and some to the dice. 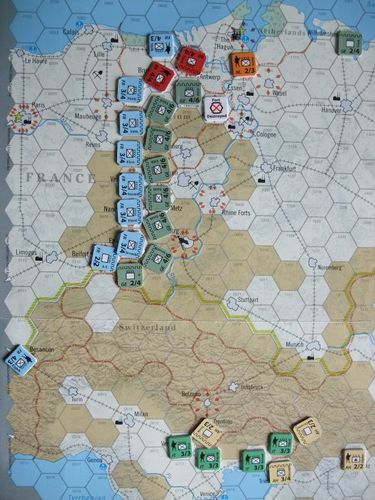 Thinking back to my many plays of the original SPI game I have had results with the Germans in Paris or the Russians in Berlin, so either are possible, as well as some less dramatic and ‘down to the wire’ results. With the 2015 errata issues resolved this is now a good game; although it does take longer than the SPI original – the detail v time spinoff. Certainly staying on the game shelf. (there are various sources for GDP; l I took my figures from David Stevenson’s ‘With Our Backs to the Wall’ and I'm dammed if I can get this to format right). So actually the AH initial resources may not be too far off, but their economy was much weaker than the Germans. Perhaps remove a Mobilisation hex or two so when the initial MP bonus runs out the drop off is quicker. Interesting the nation that loses out is Britain; and the figures quoted above are just for the UK; include the Empire and the GDP is twice that of Germany, and the population five times larger. Obviously there are other factors, but I would plead for perhaps another off map British Mobilisation Centre. But this is a quibble, and I don’t plan to get into an argument about it – after all it’s a game so we can all tweak it with our own house rules. So thank you Mr Miranda for your successful update of Jim Dunnigan’s classic. Who knew trench warfare could be such fun? Thanks for this. I'm on the fence on this one but dangling my feet over the 'Let's buy it' side. Nice AAR! The loose diplomacy method, as opposed to historical entry, can definitely impact the game in big ways. I would recommend looking at the July 2018 errata for the Deluxe Edition, here on the wiki for the game. Properly errata'd this game is now definitely a great game to have. Every war game has errata, so I don't see this as a point against it. July 2018 errata?...it never ends! Where can I find the wiki for the game? It is part of the BGG page. And MayorJim, if you have the Deluxe Edition it is just a handful of lines, mostly clarifications. I don't think I've ever owned or played a game that didn't have any errata.